Political pop was partly a response to the rampant modernisation of the country, but also was a way of coming to terms with the Cultural Revolution. With pop’s banality and semi-ironic approach to capitalism, combined with propaganda images from the era of Chairman Mao, artists challenged the prevailing attitudes to art in China. 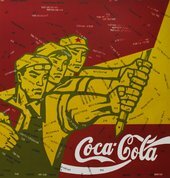 A work like Blue Mao by Li Shan referenced Andy Warhol’s screen print portraits of the Chinese leader, while Wang Guangyi’s Great Criticism – Coca Cola depicted Chinese workers in a socialist realist style painting a sign for Coca Cola. Critics of political pop have argued that the movement does not fully engage because of its strategy of imitating propaganda and consumerist discourse. The artists have also been accused of using stereotypes to meet the demand of the Western market.